Frozen desserts for a potluck - Do You Know The Muffin Man? Notes on Maple Syrup Pecan Ice Cream: The one unusual thing about this recipe is that the cream/egg mixture is baked in ramekins in a water bath. One thing that amused me in the recipe is the line about using a good maple syrup; the authors say the real stuff has a maple leaf on the container. I used Canada #2 Amber. Instead of using plain chopped pecans, I made a half batch of maple sugared pecans following a recipe from In the Sweet Kitchen. Very tasty with great maple flavour, with none of the grittiness often found in commercial ice creams. Another picture of the ice cream at the potluck, from Sifu Renka's set. 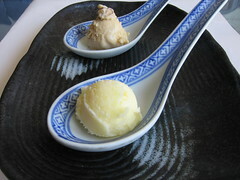 Notes on Jackfruit Sherbet: Using canned yellow jackfruit, I made this simple sherbet. The fruit grinds fine enough that it slipped through the holes of my strainer. The texture is a little gritty. But the flavour is there and that's what matters. Another photo of the assortment of ice creams from the potluck, from Jen's set.